Rubenerd: On ANZAC Day, New Zealanders get this? On ANZAC Day, New Zealanders get this? The draconian three strikes bill we were all hoping wouldn't pass… did. The full text of this bill can be found on the New Zealand Government's Legislation website. For the sake of brevity, I'll be commenting on Clarice Africa's FutureGov article. Pardon my rage! Could the timing be any more blatant? And along with it a further erosion of New Zealand sovereignty to the United States and its media cartels. In other words, a New Zealand law has been replaced with a faulty international one that would make Nicolas Sarkozy proud. Fortunately we can take a small measure of comfort from the fact it defines the suspension in terms of an "internet account", so the alleged offender could just use internet somewhere else. While representing a substantial threat to civil liberties in New Zealand, ultimately its unenforceable and worthess. They "may" have infringed copyright. I suppose the presumption of innocence until proven guilty and due process aren't "efficient" nor "low cost". "Online copyright infringement has been damaging for the creative industry, which has experienced significant declines in revenue as file sharing has become more prevalent. Evidence of damage and causation please. "This legislation will discourage illegal file sharing and provide more effective measures to help our creative industries enforce their copyright" he said. Evidence of potential alleged effectiveness please. As well as the threat to New Zealand's sovereignty and the appalling trampling of the rights of our friends across the Tasman with funny accents, frankly the timing is disgusting as well. Using a national tragedy to distract people and push through such a draconian law is despicable. In the context of where the bill was past this quote from my grandfather seems partifucularly apt: if you played a roll in passing this bill, may the bees of a thousand hives nest in your armpits. 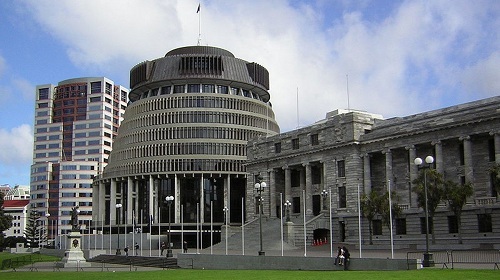 Photo of Bowen House, the Beehive and Parliament in Wellington by Midnighttonight on Wikimedia Commons.